"My goal is to serve and uplift in the Lord's word as the musical director for the Praise and Worship Team at Greater Blessings Tabernacle of Praise in Tallahassee, FL." The wearer of several gospel hats, Pastor Harvey is not only an artist himself, but the President of Innovative Records, the record label that Angela Spivey is signed too. 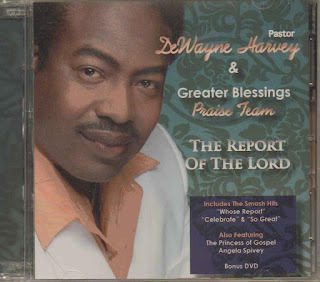 Pastor Harvey will release a new CD in 2012 and he performed on September 2 for the Black Enterprise Pepsi Golf & Tennis Challenge - Sunrise Service at the Doral Resort in Miami, FL.